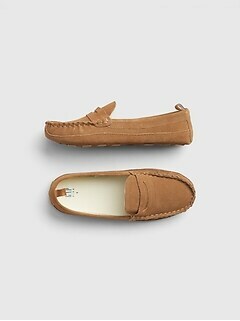 Our baby moccasins are selling out quickly. Grab them before they're gone and check out our related products for more styles you will love. 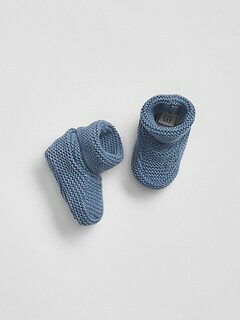 Browse this cute and playful selection of baby moccasins available at Gap. Find adorable and stylish footwear options for your little one with the exclusive collection of baby and toddler moccasins now available at Gap. 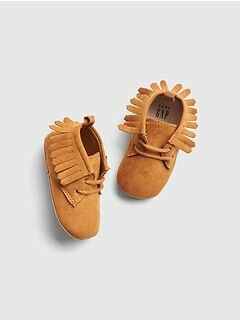 These cozy infant moccasins are made from luxe-looking materials such as suede, fuzzy flannel, and metallic leather to set them apart from the very first glance. Your child will enjoy all-day comfort with these distinctive profiles that are lined throughout with plush materials. You'll love the aesthetic of these shoes that are finished with fringe accents and other decorative details. This special selection of the best baby moccasins are a great choice for little boys and little girls, adding an instant dose of visual appeal to their everyday attire. They also feature grippy outsoles for excellent traction on a variety of surfaces along with easy slip pull tabs to encourage independence as their motor skills continue to develop. 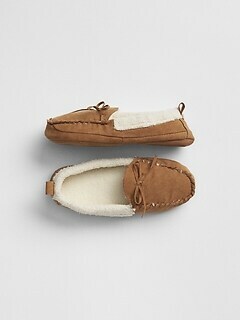 Find a full selection of moccasins for babies in the updated inventory of infant footwear now available at Gap. Warm moccasins for babies can be an easy to wear alternative to standard shoes and sneakers. These shoes are a natural choice whenever there's a chill in the air, providing greater insulation than socks alone to keep tiny feet comfortable and protected. Expand the possibilities of your little one's wardrobe with the special selection of baby footwear from Gap. Pair moccasins showing off fun fringe or decorative bows with a colorful graphic tee and jeans for a low maintenance look that's perfect for a play date. These same shoes also work well in more refined venues such as dinners and other family outings, punctuating polished combinations, such as a button front shirt and chinos, with uncommon flair. You can even use this cozy footwear as an indoor shoe thanks to high traction nonmarking outsoles, so they're perfect for a lazy afternoon in the house. The best part is that these shoes are designed to make getting your child dressed easier. 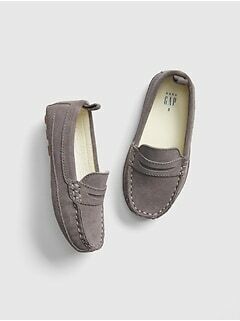 Get more options for your child's regular rotation with moccasins for babies at Gap.